This Is Getting Old: What Happened? At the conclusion of my Game 1 recap, I warned that this Montreal team could bounce back and completely change the course of the series. And, well, the 3-1 loss in Game 2 could not have been any more different from the first. One of the main stories of the game, and rightfully so, was the play of Jaroslav Halak. After getting chased after 5 goals on Friday night, he was unflappable saving 38 of 39 shots and making some incredible saves early in the game. The turnaround in the performance of Halak was only half of the reason why things went so wrongly for the Pens. The Pens got away from doing many of the things that they were so successful with in Game 1. 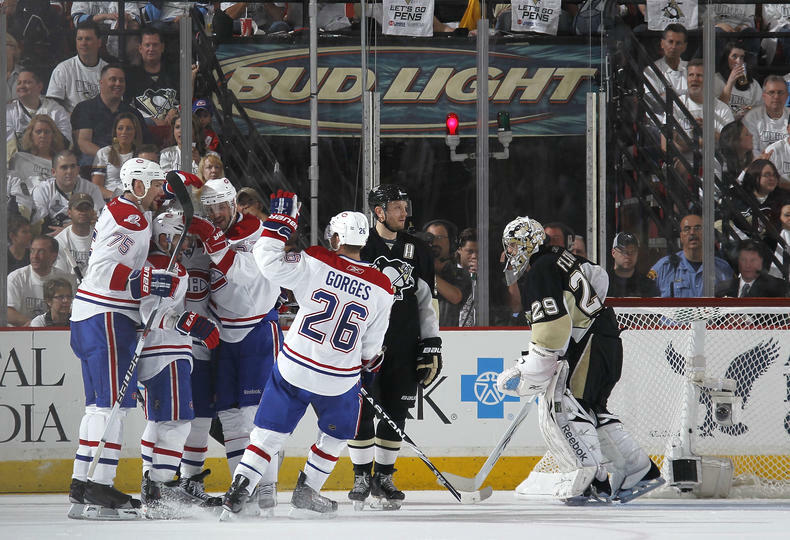 Their perfect powerplay in Game 1 was held scoreless, even though they did not get very many opportunities. Another thing that the Pens did so successfully in the first game was to bring the puck into the zone and move it around. This ability to settle down the gameplay and get traffic in front of Halak was absent in Game 2, as the Pens seemed content to just try to skate around the perimeter and hope for a pass in front of Halak. Montreal's defense caught on to this, and while the Pens certainly had a number of chances, they were all manageable for Halak and he held down the fort. The other half of Montreal's game was to capitalize on mistakes and opportunities given to them. Their first goal was scored when Brian Gionta managed to get himself open in front of Fleury and shot one that was just a bit too quick for him to get. Mike Cammalleri also was effective at this, and managed to score two goals in opportunistic fashion. His first goal came early in the second on the powerplay when he batted the puck in midair past an unexpecting Fleury to put the Canadiens up 2-1. He also was the one who put the game away in the closing minutes by wristing one past Fleury on a breakaway caused by a neutral zone turnover. The Pens' lone goal was scored by Matt Cooke, who along with linemates Max Talbot and Pascal Dupuis were likely the hardest working and most valuable players the Pens had on the ice. Though Fleury's numbers were not very good, (18-21) it would not be just to pin this loss on him as all three goals were incredibly difficult and would be improbable for any goaltender to save. What is important for the Pens now is to remember that the series can flip flop back just as quickly as it did the first time, and Halak and the Canadiens could get very cold again. But even if they don't, the Pens can still beat them. They must just remember that with Halak it is not necessarily the number of shots you get on him but the quality of the shots and the traffic placed in front of him. The Pens and Habs play Game 3 Tuesday night at the Bell Centre, and it could be pivotal in deciding the outcome of the series.